La Côte Exquisite Knife Set Carefully selected exotic wood veneers in our signature handles are only the beginning of what makes these knives unique. 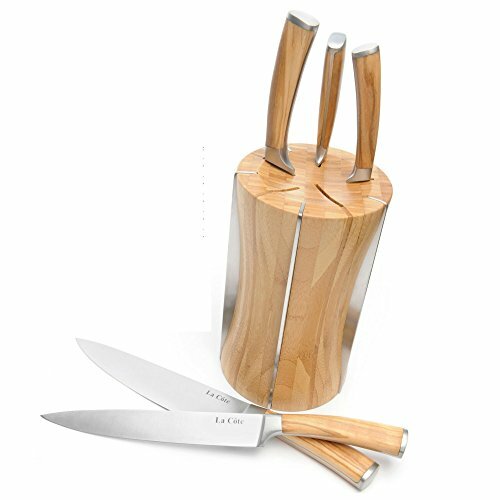 The stone finished steel blades and exotic wood handles is built to last with top quality materials. The natural color flows throughout the material while sanding and buffing the completed part yield a glossy finish without any spraying. As in nature - where no two pieces of wood are exactly alike - our knife handles elicit the same feature, you will immediately see differences in color and grain structure that create characteristics unique to each piece. Material & handle: Mediterranean Olive Wood is recognized as one of the densest and most durable of all woods & the only source of olive wood we use. It's naturally high oil content, slow growth and tightly grained pores makes it resistant to damaging moisture, further enhanced by our manufacturing process. Handle Shape: We designed these exclusive handles whether you're right handed or left handed. Our handle shape is ergonomically perfect & will mold right into your hand. Why we use 420J2 Japanese Steel: This specific Japanese steel used is sub- zero treated, 54-55HRC, some call it surgical steel. Our steel thickness combined with its metal hardness makes it almost impossible to break or rust, unless you soak it in super harsh chemicals. For this we use 420J2 Japanese steel instead of German Steel. Our blades are finished with a water stone for the perfect brushed effect. Blade Measurements: 8" CHEF KNIFE, 8" SLICER KNIFE, 8" BREAD, KNIFE 4 1/2" UTILITY KNIFE, 3 1/2" PARING KNIFE. Blades are 2.5 mm in thickness, Hand Guard Bolster, stone finish, double bolster, full tang, secure & comfortable grip, weighed for stability control & balance. Packed with our exclusive handmade Bamboo Block with metal rims. The bamboo block has been sanded, polished & lacquered to a smooth glossy finish. 100% Satisfaction guaranteed or your money back. Try it risk free. View More In Chef's Knives. If you have any questions about this product by La Côte Homeware, contact us by completing and submitting the form below. If you are looking for a specif part number, please include it with your message. Liquidiamond Edge 8" Chef's Knife - "The Edge"